Jacalin, belonging to the lectins family, is a tetrameric (M.W. 40 kDa) carbohydrate-binding protein isolated from the seeds of jack fruit Artrocarpus integrifolia agglutinin. It is well known that lectins have been used extensively for the isolation of glycol-conjugates and glycoproteins with specific carbohydrate structures. Jacalin shows specific affinity for molecules containing non reducing α-D-galactosyl groups, usually present in the biochemical structure of IgA1 and cell membranes. Jacalin ( M.W. 40 kDa ) , from the seeds of jack fruit Artrocarpus integrifolia, is coated using 100 μl/well. The strips are post-coated ( blocked ) for low non specific binding and long-term stability. 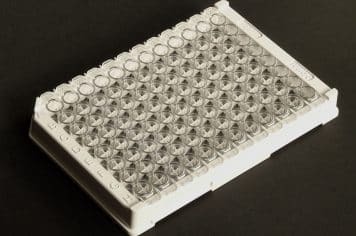 Microplate was saturated with biotinylated human IgA at a concentration of 6 μg/ml (600 ng/well) in an ELISA format using Streptavidin-HRP as detector and TMB as substrate. Biotinylated human IgA was detected at a concentration significantly above background in an ELISA format using streptavidin-HRP as detector and TMB as substrate. 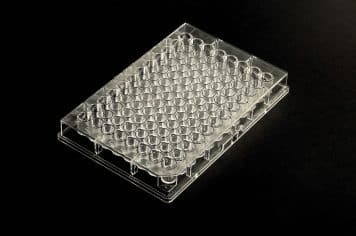 Microplates show a CV% less than 5 when used as a catcher of biotinylated human IgA in an ELISA format using streptavidin-HRP as detector and TMB as substrate.